Testimonials add credibility. It builds trust because it is a firsthand experience of a client and is unbiased. 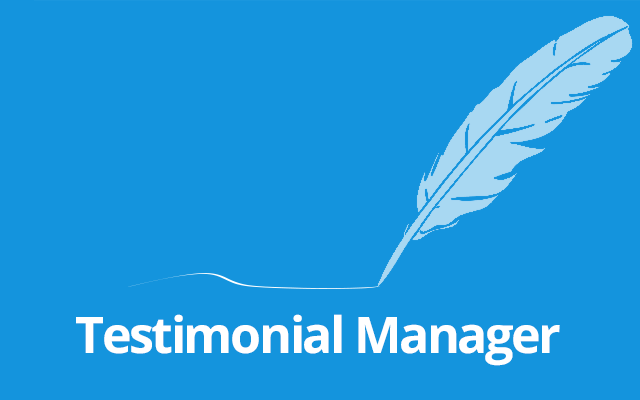 Gather testimonials that tell the benefits of working with you and your agency. 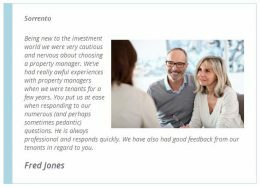 Testimonials can be an effective way to get more listings. They add credibility and builds trust. With this plugin, quickly add testimonials and have them link with properties in specific locations. 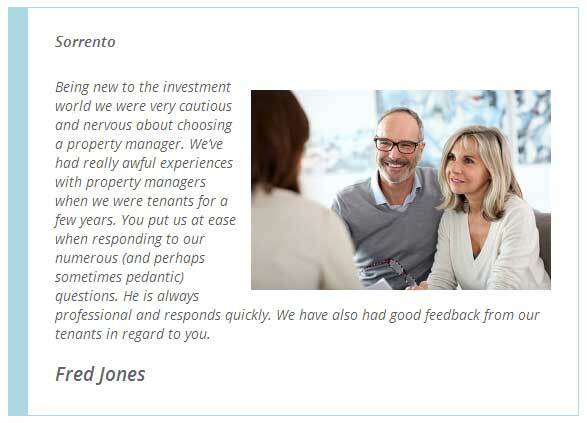 Sell a property in Sorrento and display testimonials on your Sorrento property from happy clients. 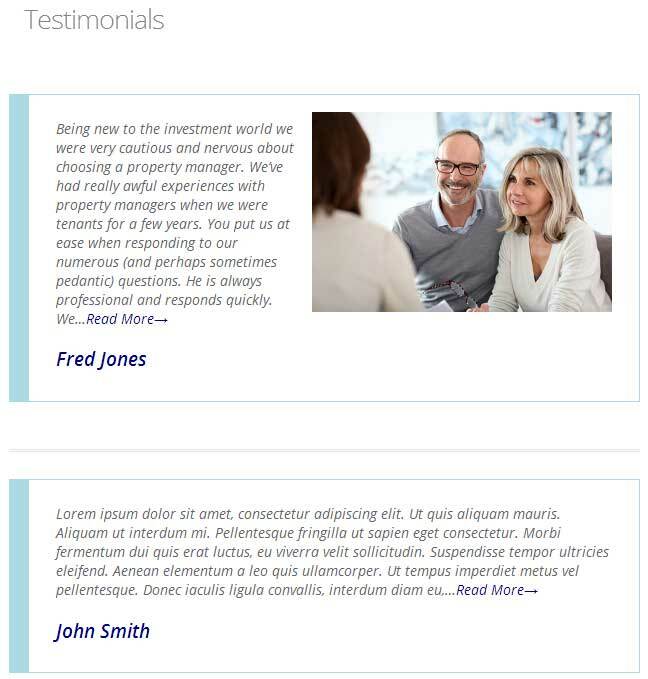 You can also display the current page author’s testimonials. And this add-on comes with widgets so you can quickly and easily add testimonials and display them at random. Take your marketing to the next level so gather those happy clients’ testimonials now and manage them easily with this plugin! This add on comes with widgets so your can quickly and easily add testimonials and display them at random. New: Extension now uses core EPL template files, minimising setup. New: [epl_testimonials] shortcode enhanced with additional options. New: Responsive CSS improvements to admin pages. New: Translation ready. Text domain set to epl-testimonial-manager. New: Customise the /testimonial/ page slug. Change Directory to Reviews, Success Stories or anything. Once adjusted, visit Dashboard > Settings > Permalinks. New: Internal documentation added to all files and functions. Tweak: Deactivating extension will no longer remove settings. Fix: No longer displaying empty titles. New: Shortcode [epl_testimonials] allowing you to output testimonials using a shortcode. New: When Staff Directory extension added, provides testimonial options to staff members. New: Install function to set default values. Tweak: Added CSS classes to testimonial location header and title. Fix: When listings have a blank id, linked testimonials are no longer output on a listing. Fix: Widget construct fix for WordPress 4.3. Tweak: Converted file End Of Line formats. Fix: Location setting correctly enabling on archive and single testimonials. New: Added easier to manage admin pages with thumbnail previews. New: Notice displayed if Easy Property Listings is not active. New: Permalink refresh on activation. New: Ability to link to a specific listing by id and display the testimonial. 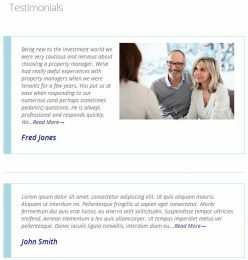 New: Customise title for testimonial on a listing.